In 1887, the Board of Supervisors appropriated $20,000 to purchase a suitable location and erect a new building for the sheriff’s residence and jail, and to remodel the old jail into vaults for county records. The Neil Donnelly property, adjacent to the north, while the most expensive, was considered the best choice of locations. The Sheriff and his family moved into the new structure in November 1887. They resided in the east half of the building and the jail was in the back. The sheriff’s wife was expected to cook meals for the prisoners. The jail’s best known prisoner was Eugene Debs who during his six month stay in Woodstock was called on by prominent national and international visitors. On the first floor there were 8 steel cells, each with two steel wall cots, a toilet and a stand. The second floor was reserved for women and boys—4 cells for each. Each cell had an outside window and there was a bathroom for each section. A padded cell was provided for the insane though not all sheriffs used it–some treated the insane as sick and in need of care—not dangerous criminals. 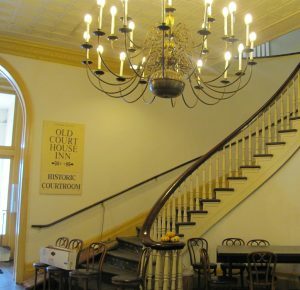 The Sheriff’s office was located on the second floor of the old courthouse until around 1950. It consisted of two rooms that overlooked the square. When the sheriff got a call, he and his deputy had to race down the curved staircase, then down the stairway to the boiler room, and out the back door to the garage on Throop Street. Finally the office was moved to the basement of the Sheriff’s residence, giving a little more room for the addition of detectives and the police radio. The basement of the jail was also used for evidence storage. Up through the 1950’s, it held many confiscated slot machines from raids until there was court order to destroy them. During prohibition, one raid netted 100 barrels of beer which were held in the basement and then dumped down a drain. At other times, fine wine, beer, and clear moonshine were dumped as well. Sheriff Hick Nulle was the first to use two-way police radios; however, it was not a perfect system. Radio calls to the Sheriff’s office interrupted church services at the Baptist Church located across Throop Street on the back side of the courthouse. The police radio antenna was located on top of the courthouse and somehow the amplifier in the church organ would pick up police radio calls.